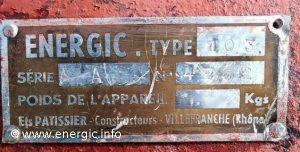 Identification Plaque positioning and type. 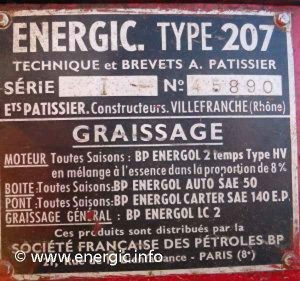 The position of the identification plaques was dependent upon the series of tracteur, motoculteur, motobineuse etc. 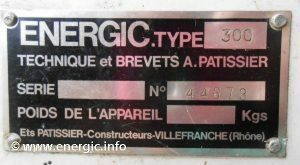 All had different positions for the identification manufacturers machine information, this was also true within the series also. 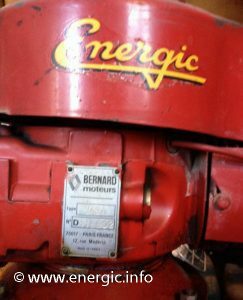 But eventually became standardized as the manufacturing process accelerated into mass production. 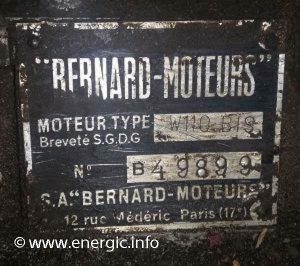 Many different moteurs where used within the ranges, from ILO, Bernard, Slanzi, Cérès, Indenor, Perkins etc., the list goes on. 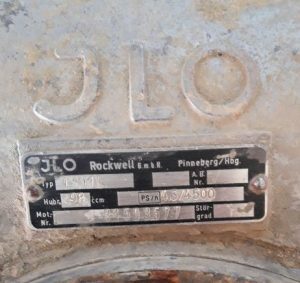 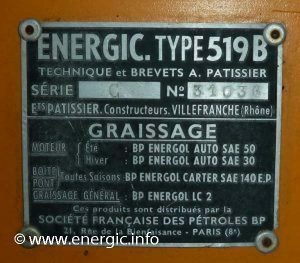 There is often a engine identification plate and a Energic identification plaque on machines. 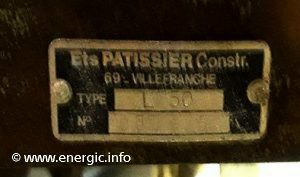 On the older type machines Ets Patissier initially used a gold back ground with silver out on a aluminium plaque befiore moving to the standard black back ground with silver out on a aluminium plaque. 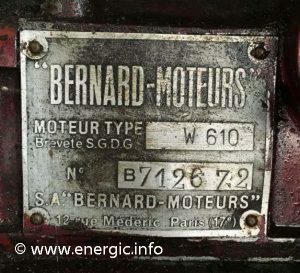 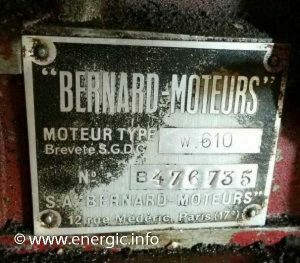 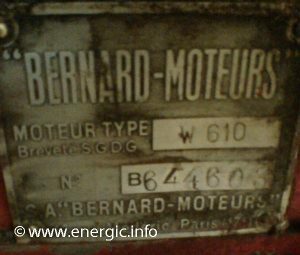 The Moteurs Bernard own series identification plate is placed on the engine. 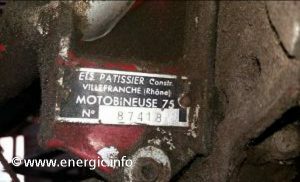 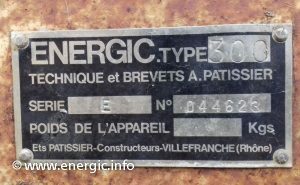 Energic motobineuse L 50 moteur plaque. 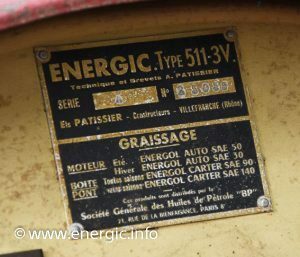 Energic Motobineuse type 75 CL Lant/slow. 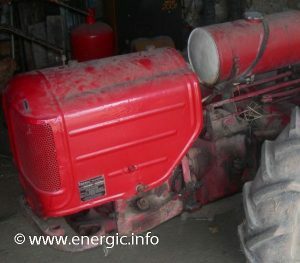 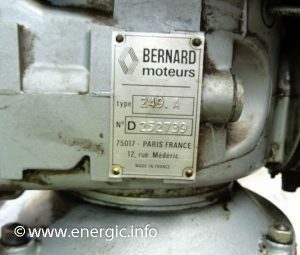 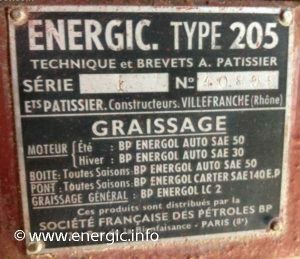 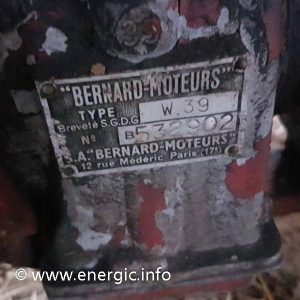 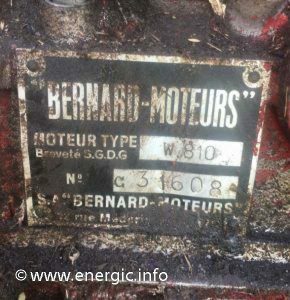 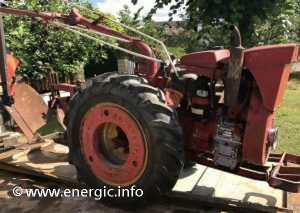 Energic Motofaucheuse moteur Bernard 239A. 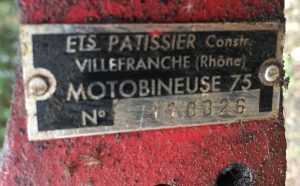 Motoculteur 114 with original W39. Motoculteur 200 series; 204, 205, 206 & 207. 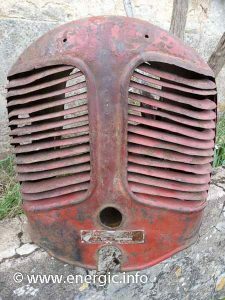 Positioned on the tool box on handle bars. 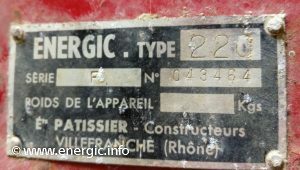 The position is on the side of the tool box for the 200 series. 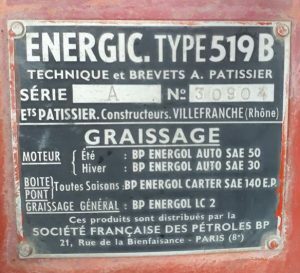 The 220 series identification plate is placed on the left hand side of the hood/bonnet. 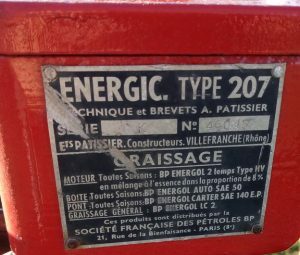 The 220 series engine identification plate is placed on the right hand side of the engine,as above. 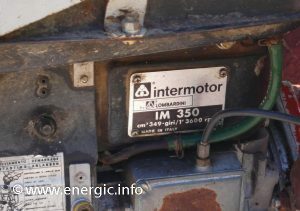 Motoculteur 300 series; 310,311, 312, 314 318, 350 and 360 Diesel. 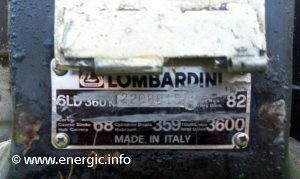 The 300 series identification plate is placed on the engine cover. 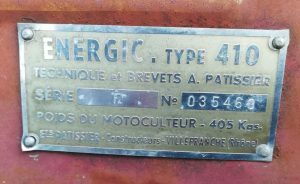 Motoculteur 400 series; 409, 410D, 411, 412 D. Originally on the first 200+ motocultures postioned on the righthand side using a D9 plaque as a reeference. 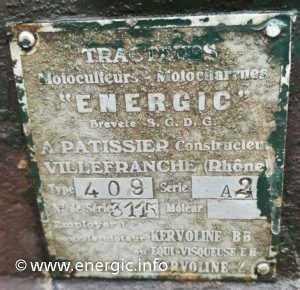 Energic motoculteur very first 409 plaque. 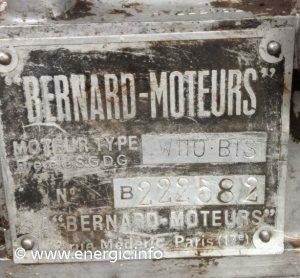 Then the plaque was changed to a horizontal front mounted under the 2 holes of the engine cover/capot. 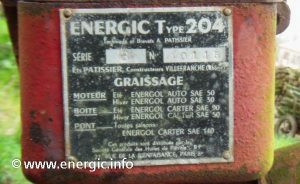 Energic motoculter identification plate on the 409 was originally positioned at the front between the 2 starting holes. 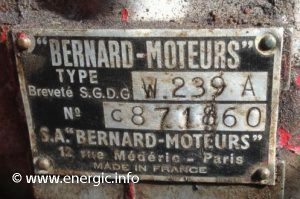 This was, then moved to the right hand side for later models same position as the 411 plaques. 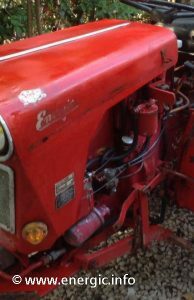 The 410/412 where plaqued on the left hand side of the engine cover. 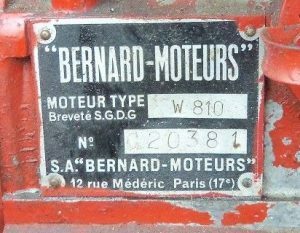 Then the identification plate moved to the left hand side of the hood and changed to a almost square plate from horizontal. 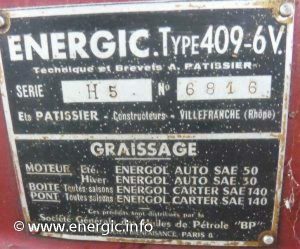 On Energic motocultures 409/411 models. 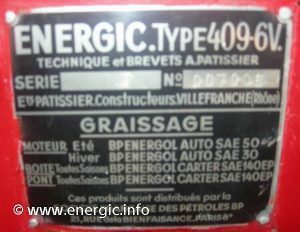 The 410/412 identification plate is placed on the right hand side of the engine cover. 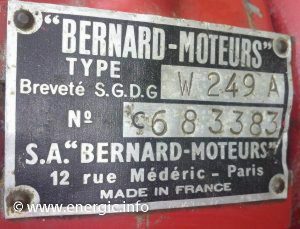 The 4RM identification plate is placed on the left hand side of the engine cover. 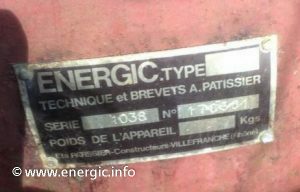 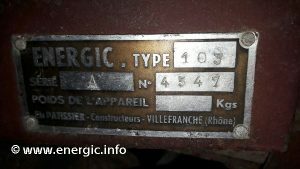 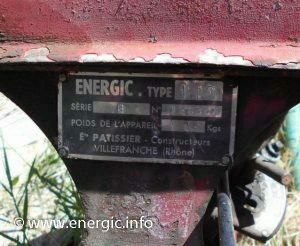 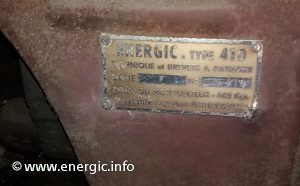 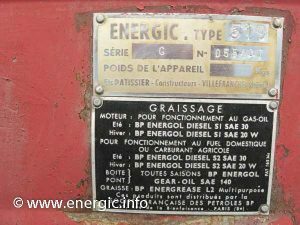 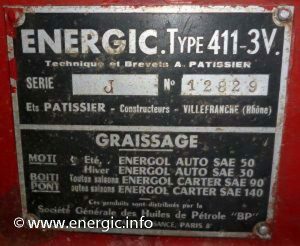 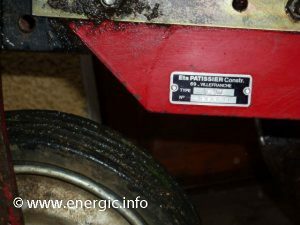 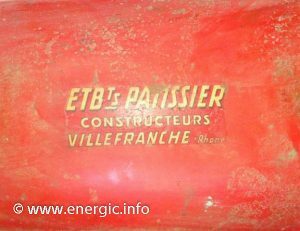 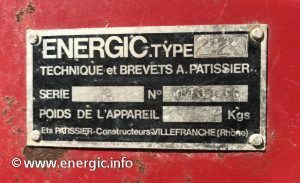 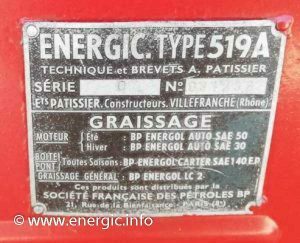 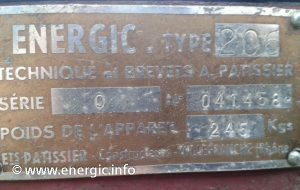 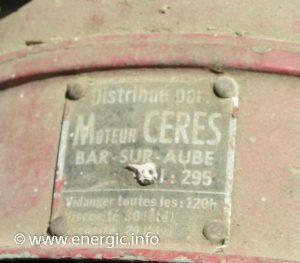 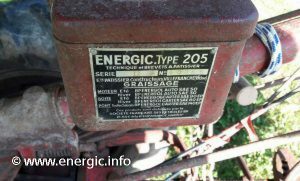 Energic 511 3v tracteur moteur plaque. 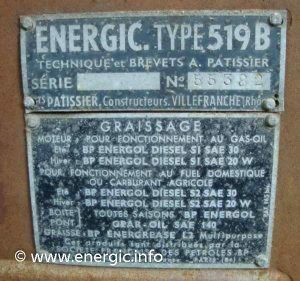 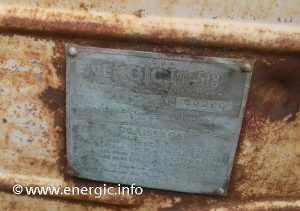 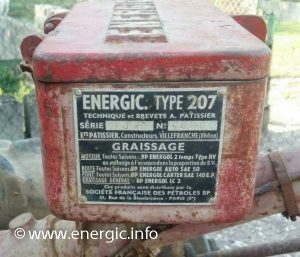 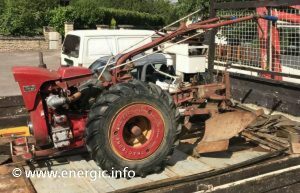 Energic 518 tracteur very early plaque. 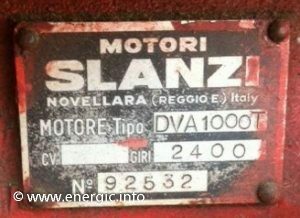 Updated on a regular basis!